"Set a goal" is one of the maxims hammered into business school students who are told, over and over, that without a goal there can be no success. It seems a simple concept, but it's one too often overlooked by boatbuilders-unless you count "the most boat for the buck. 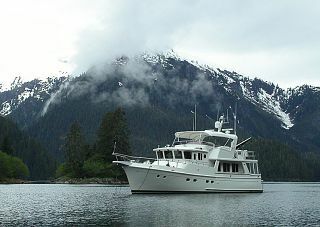 Offshore Yachts, however, has built a reputation on one maxim: The softest ride on the water. "The bottom line, says Offshore West president John Olson, "is that we're willing to sacrifice speed for ride comfort. It's a philosophy that has served the company-and literally hundreds of owners-for nearly six decades. Just after WWII, Richard Hunt helped pioneer fiberglass construction in the U.S. Navy and went on to develop his own fiberglass cruisers. 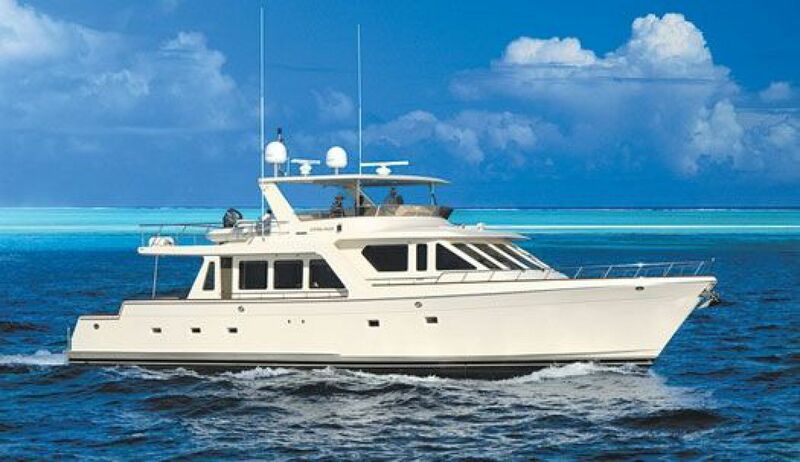 In the late '50s, his sons joined Offshore Yachts and commissioned naval architect Bill Crealock to produce a line of handsome, high-quality cruising yachts. 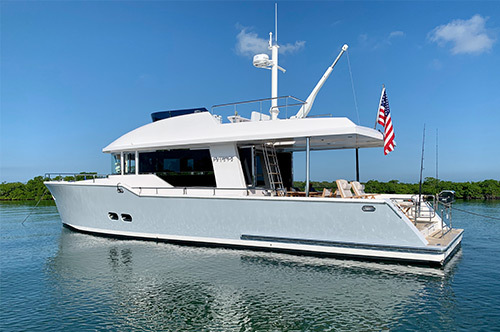 The new 72 cockpit motoryacht is a stylish extension of Offshore's concept of comfort, yet this yacht is no slouch. During sea trials, the first 72 easily exceeded 19 knots, with a mile-eating cruise speed of about 16 knots. For those looking to sprint to Avalon for lunch, this may seem slow. But an Offshore 72 probably isn't right for them, anyway. 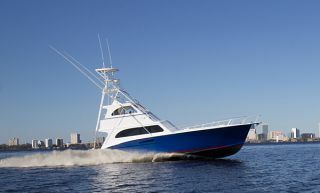 The Offshore, as its name suggests, is designed for comfortably luxurious offshore cruising. 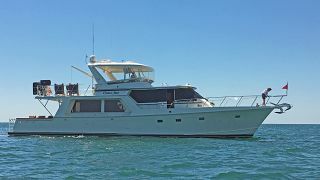 From Alaska to the Florida Keys, Offshore yachts have carried their owners and guests through every possible weather condition, and it only takes a few moments with an Offshore owner to find out how much he loves his yacht. I watched as the 72 was being hauled out, and the reasons for her seakindliness are clear. 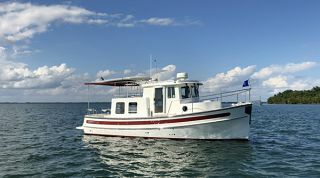 For the 72, Crealock specified a deep forefoot and a 12-degree deadrise at the transom to make the boat easy in a seaway. And the long keel, substantial displacement and low center of gravity give her a gentle motion. One set of chines is below the waterline, while another above the boot top knocks down spray. The 72 is a big yacht, yet she's one that can be taken out by a couple. Although Olson expects many 72s to be run by the owners without crew, the crew cabin aft is spacious. 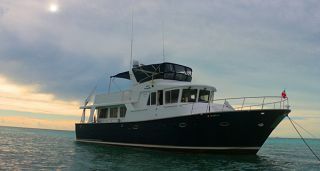 The only difference between the 66- and 72-footers is the cockpit, which some owners choose for fighting fish and others because it simplifies boarding. The cockpit also increases the area available for storage or additional fuel tankage. 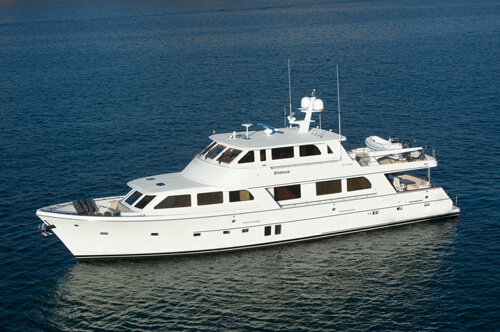 The aft deck can be easily enclosed for all-weather use, and it has the expected lounge seating and wet bar. Once inside, the first impression is of the oversized windows, which start at couch level. 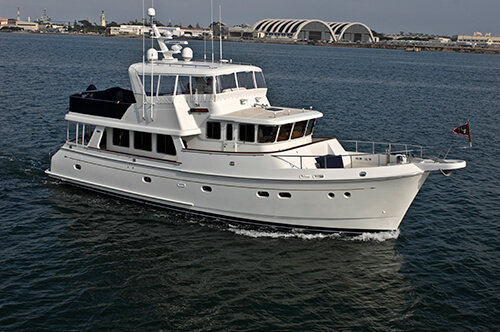 Unlike on many pilothouse yachts, the galley is on saloon level, a reflection of the cruising focus of the yacht. Yes, it does take up a bit of space, but, on the other hand, it frees up the pilothouse to include a settee, which is nice because this is where most people congregate while cruising. At anchor, the saloon and galley blend together into an entertainment area. Set amidships, where it will be comfortable during sea voyages, the master stateroom has a king-sized bed, twin cedar-lined hanging lockers and built-in nightstands. The spacious head has an oversized all-molded shower stall. The pilothouse features a pair of Stidd helm chairs, ample space for electronics in the dash panels and lots of headroom. Articulating doors open to the side decks, which makes it easy for the skipper to handle lines in short-handed docking situations. 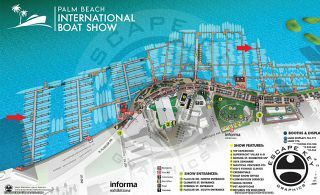 Forward, the VIP cabin fills the bow with a tapered double berth and airlifts reveal a cavernous storage area with lift-out bins. A private door leads to the head, which also has a shower sized for real people. Opposite the head is the port cabin that, in the case of our test boat, has been fitted as an office, with a desk across the forward bulkhead and two bunks aft that convert into a couch for lounging. An alternate arrangement provides an en suite head for this cabin, but it sacrifices the office function that I think most owners will find appealing. The flying bridge is so spacious that with the tender launched there is room on the deck for a dance party. Twin Stidd chairs and an L-shaped settee are fitted in the helm area. A console to starboard has a sink, fridge and cooler box, while one behind the settee has an icemaker and two-burner Gaggenau barbecue. This particular 72 was fitted with a 15-foot Novurania RIB and a Brower crane, although you could probably carry a larger tender with no problem. The chocks are flush-mounted for easy removal, and there are handrails and a hatch over the steps to the aft deck. The optional hardtop has light fixtures, including night vision lights, and a nonslip surface and ladder to allow, perhaps, for a better vantage point when threading through reefs. The covered side decks reveal several thoughtful touches, such as the recessed cleats and the hidden storage for the boarding ladder. With raised bulwarks forward topped by stainless steel rails, the foredeck is a safe place for anchor handling. 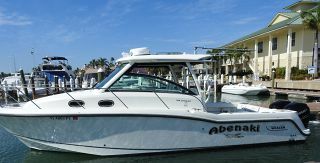 Dual-anchor rollers and a Maxwell 3500 windlass are standard, and there is an oversized rode locker plus storage space for deck gear and fenders. Underway, with her long keel the 72 tracks straight in quartering seas and the standard Wesmar stabilizers keep her rock solid, while the Wesmar hydraulic bowthruster lets her ease neatly into tight slips. To really appreciate the Offshore 72, you need to take her out into the afternoon seas and marvel at the easy motion. Pretty and seaworthy as she may be, it's in the details where the Offshore 72 really shines. It's obvious from the placement of access ports and the tidiness of both wiring and plumbing that both designer and builder have spent time maintaining yachts. Large gutters surround all hatches, the boat deck and the cockpit, with the drains leading into a central outlet that leaves no telltale striations on the hull. The hands-on type will love the engineroom because the 72 is arranged for ease of service and maintenance. The wiring is neatly held behind Lucite panels, the stabilizers are fully accessible, and twin power take-offs provide redundant hydraulic power. 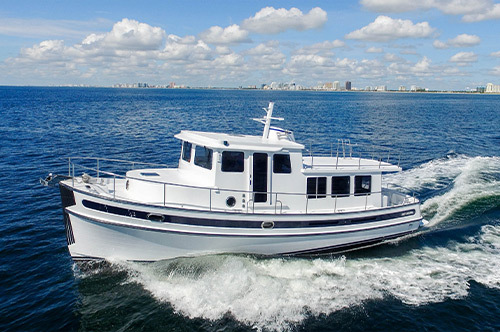 Tucked under the sole in the forward cabin is a pump room, isolating the freshwater system for easy service; even the steering gear and rudder quadrants can be reached without difficulty. This particular 72 had upgraded Caterpillar C-18 diesels of 1,000 hp each (Cat 3406s of 800 hp are standard) as well as twin 25kW Northern Lights gensets. The engine beds are massive, welded stainless steel structures, and multiple athwartship frames are laminated to the hull. But, again, the beauty is in the details. Stand back and sight down the side of the 72, and you'd be hard-pressed to find anything but a mirror reflection. That's the result of hours of long-board sanding to make each molded piece flawless. Lift a hatch and you'll find a finished underside. Check the bilges, and you'll find them gleaming with glossy gelcoat. Even the side deck overhang is detailed with faux planking to break up the otherwise monotonous panels. 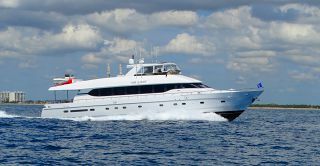 All told, the Offshore 72 Cockpit Motoryacht is one of a few new yachts that will continue to delight and surprise an experienced owner as each voyage confirms that thought has gone into its every detail.